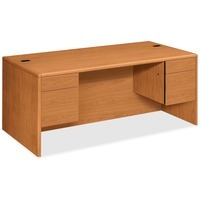 HON 10791 Pedestal Desk HON10791CC $673.99 Double pedestal desk is part of HON 10700 Series Laminate Wood Desks with worksurfaces and outer end panels clad in multilayer, high pressure laminate that resists water, abrasions and most solvents. The rich Harvest finish covers a durable, 1 18 thick, solid core, high performance particleboard that resists warping. Hardwood trim is stained to match the top grade, stain resistant laminate. Two 34 pedestals maximize filing storage space with a boxfile configuration. All drawers lock. Five sided drawer construction allows easy drawer alignment. Hangrails in file drawers offer side to side letter and legal filing and front to back letter filing. 72 wide desk also features double radius edge detail, 10 12 recessed modesty panel, two worksurface grommets to route and hide cords and adjustable hex leveling glides.